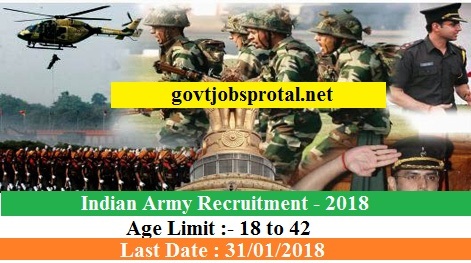 1.Applications are invited from gainfully employed young men for an opportunity of donning the uniform and serving the nation as Territorial Army Officers (Non Departmental), based on the concept of enabling motivated young men to serve in a military environment without having to sacrifice their primary professions. You can serve the nation in two capacities – as a civilian and as a soldier. No other option allows you such an expanse of experiences. (a) Nationality : Only male citizens of India. (b) Age Limits : 18 to 42 years on the date of application. (c) Educational Qualifications : Graduate from any recognized university. (d) Physical Standards : A candidate must be physically and medically fit in all respects. (e) Employment :Gainfully Employed. Note : Serving member of the Regular Army/ Navy/ Air Force/ Police/ GREF/ Para Military and like forces are not eligible. Candidates are required to apply online by using the website www.joinindianarmy.nic.in. Brief instructions for filling up the online Application Form (IAF(TA)-9 (Revised) Part-1) have been given on the website. (You will get more information in employment News paper dated on 23/12/.2017 Page no.(21).) Visit the official website for more information.